"This book is very insightful and practical. I would recommend it to entrepreneurs, CEOs, and anyone charged with HR responsibilities." Based on in-depth interviews with senior executives and business owners, HR professionals and executive recruitment firms, and with MVPs themselves, Corporate MVPs explores what makes these talented individuals tick, how to develop and cultivate them, what it takes for someone to become an MVP, and the important role of HR in managing this key talent. Corporate MVPs features practical tools, questionnaires, and checklists, as well as interviews and examples from senior executives at a wide range of organizations in a variety of industries, including: Continental Airlines, A.T. Kearney Executive Search, Northwestern Mutual Life Insurance Company, MIT Sloan School of Management, Honeywell International, Royal Bank of Canada, Limited Brands, State Street Corporation, Massachusetts Institute of Technology, Spencer Stuart, and many others. 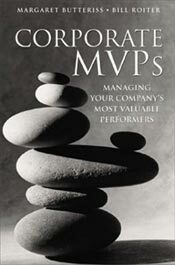 The book, Corporate MVPs, can be purchased through Amazon.com.